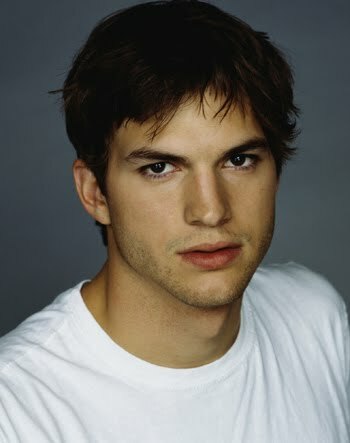 Celebrity US actor, Ashton Kutcher is visiting Israel these days, and he took time out of his busy schedule to visit...Gush Etzion! The project's director, Rafi Even D'aan briefed Kutcher and the history of settlement in Gush Etzion and spoke to him at length about the region's Jewish history. 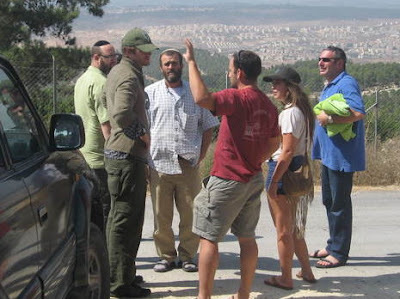 Rafi told Kutcher about the establishment of the new Jewish settlements after the Six Day War and explained the spiritual and historical significance of Gush Etzion. "Mashiv HaRuach" is a project of the Israel Center of the OU (organization of Jewish communities) and hosts every year about 30 thousand IDF soldiers to help combine and strengthen the values of Zionism and the IDF. 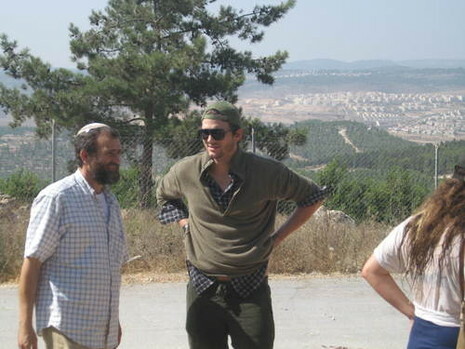 Maybe next time, Kutcher's wife Demi Moore will visit us in the Shomron? Best comment heard about his tweets: "He's such a seminary girl..."
Story translated from: NRG/maariv, Photos from the OU. with top Israeli Anti-Terror Experts! Wow, did anyone tell him about the Middle East summers? B/c of his wardrobe, that is. But seriously, this kind of outreach to the Hollywood community can go a long way toward improving the perception of Israel in the U.S. Lots of young Americans take their cues from celebrities, and if Hollywood thinks that Israel is cool, so will millions of young Americans. 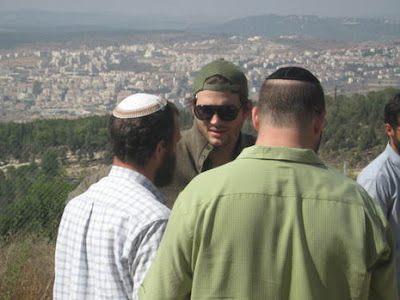 those residential buildings in the background of the photos are Jewish buildings, in Betar Illit. You shouldn't think anything else. Pehaps you can suggest that he visits the Grave of Rav Assi in Hoshaya? And dunks himself in Nahal Hacohanim? Any progress with the water story? "and if Hollywood thinks that Israel is cool, so will millions of young Americans." Normally that is true, but when said hollywood celebrities are members of the Kabbalah Center cult, its positive affects are diminished. Can "artificial meat" be Kosher? Why is the NIF against Transparency? What does it take to prove you're an enemy?